Google announced that Google Podcasts is now available on Android. This is something that many podcasters have been wanting. Google published a blog post about it on June 19, 2018. Today, we’re releasing the Google Podcasts app for Android, available globally in the Play Store. 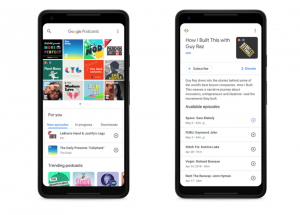 Integrated with the Google Assistant across your devices, and packed with personalized recommendations, Google Podcasts is designed to make it easier than ever for Android users to discover and listen to podcasts. We’re also announcing a partnership with industry experts to improve diversity in podcast creation, and sharing a peek at how AI can help transform podcasting for the better. With Google Podcasts, you can listen and subscribe to any podcast. Beyond the podcasts you already know, Google Podcasts uses AI to offer recommendations based on your listening habits – such as your interest in sports or true crime, or podcasts from a particular network. Google Podcast syncs across a variety of Google products, including the Google Assistant. This means that if you listen to a podcast on your phone during your commute home, you can resume it on your Google Home when you arrive.